Deafinitely Theatre makes bilingual theatre which ensures that both Deaf and hearing audiences can access high quality theatre. 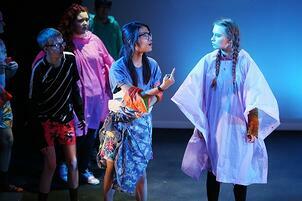 Similarly, our Youth theatre involves a bilingual group of young creatives exploring, creating and inspiring each other. Over the years we have developed and implemented a successful process for fitting Arts Award into our tight schedule of activities. We deliver Arts Award at Bronze, Silver and Gold levels as accessible qualifications, helping our young artists to gain a professional insight into the inner workings of a project. Arts Award gives individuals a recognised qualification, a sense of achievement, and the motivation to continue to develop and learn. For our deaf young people, it also provides an important chance to further individual learning. Arts Award is about being creative and my role as an adviser has been to support young people in realising that good communication is not just about their ability to read and write. Working with Deaf young people is no different to working with any other group; there are times when you are pulling your hair out because a piece of research needs to be completed on time, or other instances when you are incredibly proud to observe them while they lead a group or share a skill. Therefore, when delivering Arts Award, I try to keep the sessions as practical as possible, letting the participants experience the tasks without over-explanation. 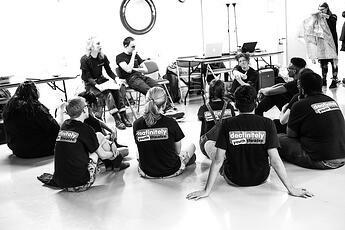 Our young people participate in sessions (Part A) led by Deaf arts practitioners, which inspires professional practice. They ask the practitioners questions and have even been inspired to go to drama school and perform on UK tours, whilst having a strong grounding of the challenges that face Deaf creatives. Spending time with professionals has helped to inspire a whole new generation. Live theatre is not always accessible, so we often visit our local art gallery (Part B). Here young people are asked to present their review ‘live’ in British Sign Language (BSL) next to the artwork, which is a more visual and direct way to share and respond to questions. We support our young people researching their Arts Inspiration (Part C) because online articles can be filled with jargon. We take the time to translate the information with the young person, so they can access it and make their own choices and opinions. Sharing an arts skill (Part D) can be daunting for many young people but with a bilingual group it presents an opportunity to decide how they want to lead; using sign, their voice or both. The group is supported by interpreters and their peers to make sure their skill is shared accessibly and creatively. Having the confidence to present to a group who is using a different language or communication choice to you, is an empowering moment which they get to keep forever. Our Silver Arts Award artists have embraced the opportunity to look at their strengths and weaknesses - often a difficult concept to grasp. As they develop their skill, the camaraderie and support we witness between the peers is fantastic. When young people interview experts (Unit 1, Part D), they work together to ask questions and take notes. Supported by an interpreter, they communicate freely with the professional, presenting the information in BSL to their peers. 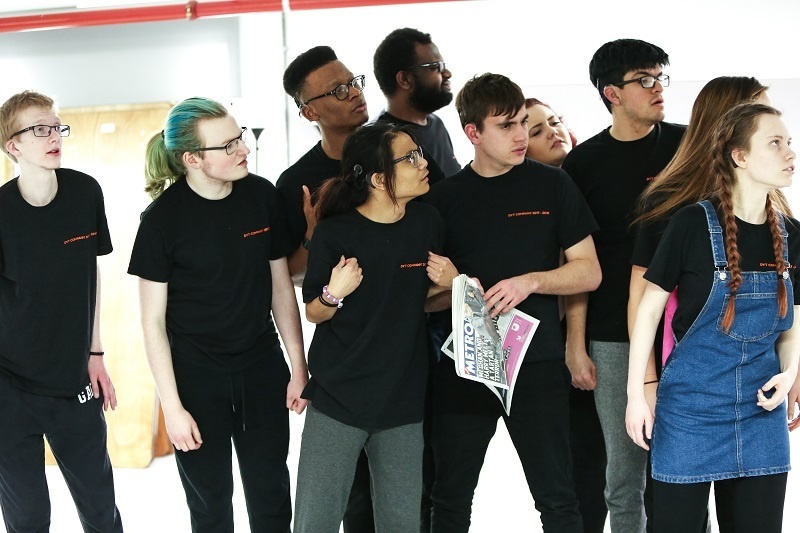 Being in a leadership role to plan an accessible arts event (Unit 2) has given Deaf young people the opportunity to confidently look after and mentor their actors, with many reflecting with pride at the fact that they were able to bring the event together. What are some of the key challenges when delivering Arts Award with Deaf young people? Time – sessions are focused on rehearsals and workshops, so we often have short one-to-ones with our young people to focus on their Arts Award portfolios. School and travel – many of the young people travel long distances or are at boarding school / coping with lots of school work. Language – jargon and inaccessible materials can be challenging for our participants therefore accessible differentiation of the tasks is vital. Admin - putting together the portfolios takes longer due to the translation of all the video diaries. It would be lovely to do this as the project progresses but is often impossible! Sense of team spirit – feedback and mentoring are integral to development. The first ‘generation’ of our Arts Award cohort were the role models for the next group. Now the Silver mentor the Bronze and continue to develop their leadership skills, peer support and future professional networks. When young people are planning, reviewing and reflecting, they have all benefited from working with others and now participants are asking to complete their Arts Award work, wanting to follow in their peers’ footsteps. Video blogging in BSL – always have a camera available so you can film diary entries on all progress and reflections. Developing a reflective process can be difficult but establishing a practical routine can encourage these reflections to become more in-depth. Visual aids – take pictures of young people taking part in activities, this will allow them to more easily reflect on things they have done. One to One time – managing Arts Award within Youth Theatre means that one-to-one drop-ins have been vital when it comes to ensuring that the communication is matching their exact needs. Whether they use BSL, English or write their ideas; short catch ups, with clear instructions or task setting really ensures that no one is overwhelmed with extra work. As we support our older students to prepare for their Gold Arts Award, we have very open conversations about how we can support them in making the tasks accessible to them. My priority when leading Arts Award has always been to free the young people to be creative and great leaders in their first language. Throughout the years they have all proved themselves to be fantastic deaf/bilingual artists with skills which will impact the industry. 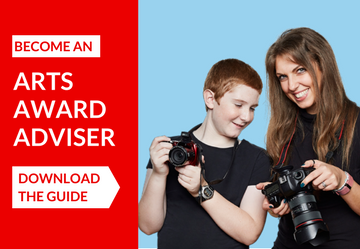 Find out more on our website about access support that Arts Award advisers can request or click here to find out how Arts Award is designed to be accessible to children and young people with a range of abilities, backgrounds and individual learning requirements.